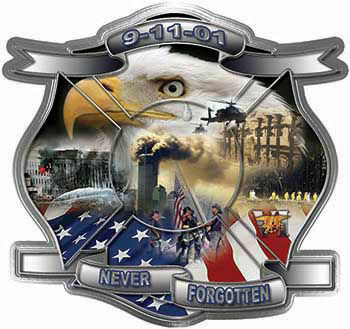 This unique design is a tribute to all involved since the September 11th attack on the World Trade Center. Not only does it include the events on that awful day it also is a tribute to those that have fought to keep our freedom since then. All the way from the day of the attack to Seal Team 6. Its all included inside this unique one of a kind graphic. Show your support and make your truck, tool box, motorcycle, Inside or outside walls or any flat smooth surface stand out with this unique graphic. Our new 7 Color translucent ink process makes all of the color of this graphic reflect with the reflective option and we now offer this graphic in a special canvas like interior wall decal. Along with these we have face decals, arcs, markers and tetrahedrons to match for your helmet. If you want to go further check out our reflective lettering and numbering to add an additional personal touch to each one. We also have Custom Options to add any text you would like.